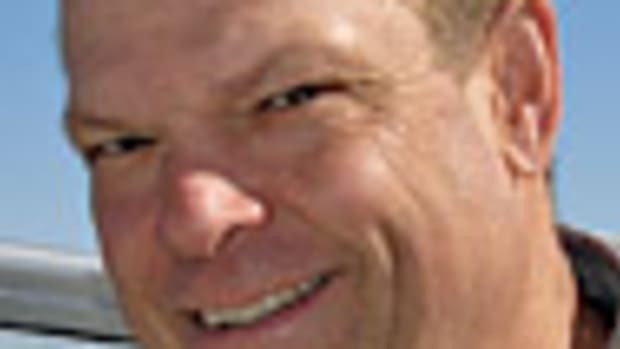 All the boat design and construction elements this column usually focuses on don’t mean much unless they make a difference where it matters: out on the water. What’s important is that the boat is seaworthy, safe to be on, rides and handles well, and cruises, plays and fishes the way you want it to. 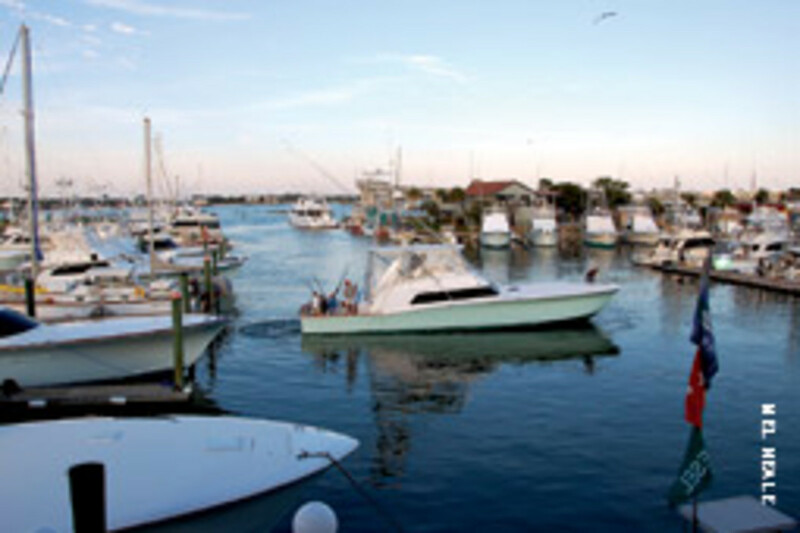 When it comes to boat handling, how much control you have over the proceedings depends to a large degree on the boat itself, not just the depth and breadth of your boating experience. Some boats just handle better than others, are more forgiving of errors in judgment, are less susceptible to crosswinds — in general, are simply more predictable around the dock. Whether looking like an old salt is important to you, or your family’s serenity around the docks rather than your pride is the motivator, buying a boat that’s intrinsically easier to handle should be a priority. 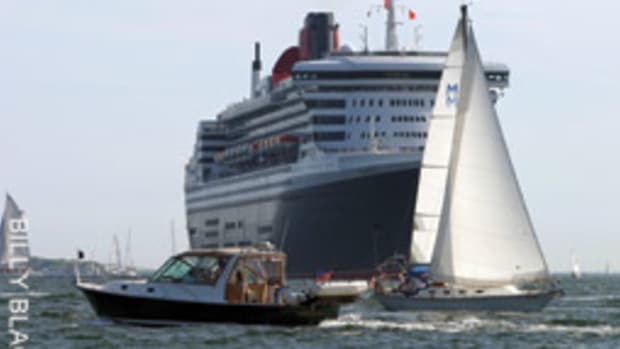 So let’s have a look at whether your boat is a help or a hindrance by design when it comes to controllability. First, what do we mean when we say a boat handles well? What it means is the boat is responsive to steering and propulsion, so when you put the rudder over or put the engine in and out of gear, you get a potent response rather than an anemic one. This takes rudders or drives that are large enough and turn over far enough to result in an action coupled to an immediate reaction. It should also handle predictably, and by this I mean, in part, that it should not be blown around at the whim of the wind. This requires a good balance between above- and below-water profile areas, which means you don’t have a two-deck superstructure on a 40-footer with a shallow hull, no keel, and wimpy little rudder and props. This proportional balance — and the larger props and rudders — creates a boat that handles predictably and with certainty to your maneuvering control input. 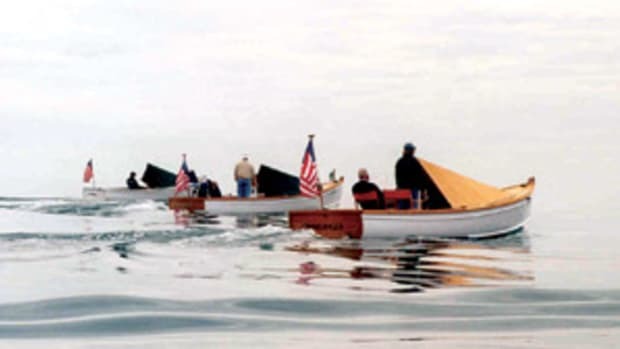 For example, my 42-foot single-engine Maine-style lobster boat with its deep keel, large prop and barn-door rudder handled better around the dock than many twin-screw, bow-thruster-equipped floating condos. 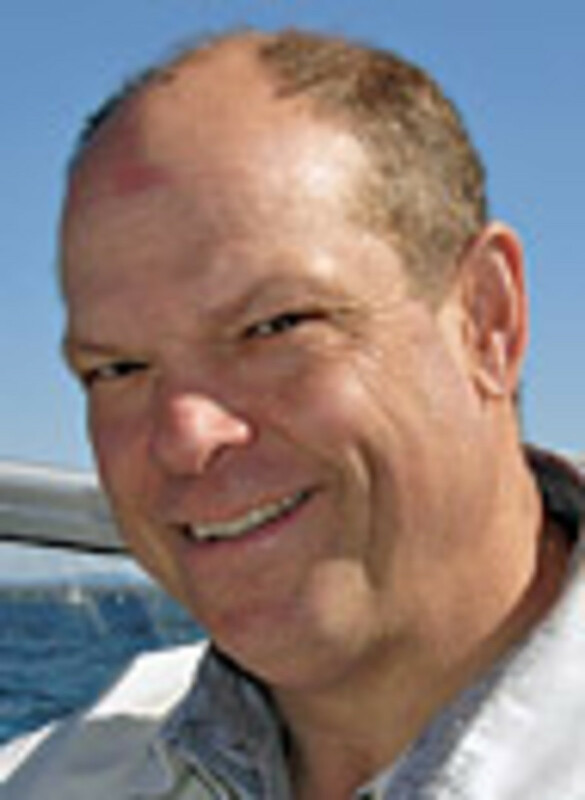 So what difference does the propulsion type make in the boat-handling calculus? 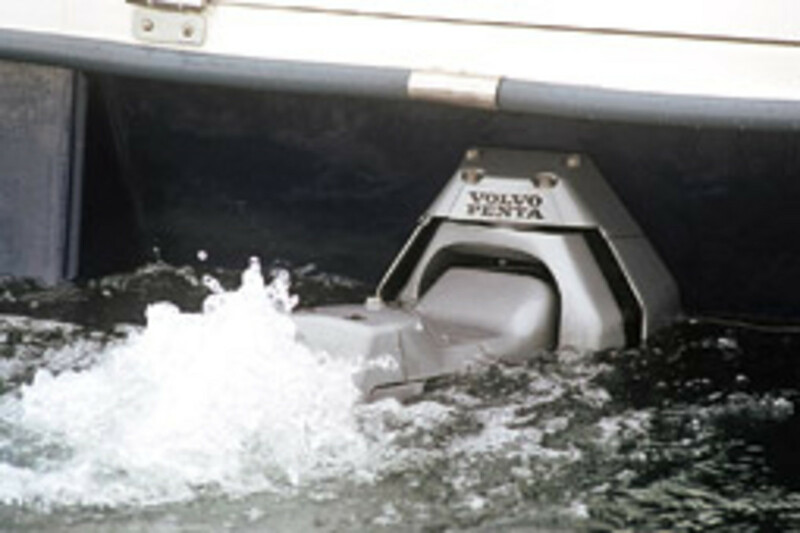 When it comes to propulsion systems, there’s no doubt in my mind that Volvo Penta’s IPS and CMD’s Zeus pod drives make boat handling easier than any other system. 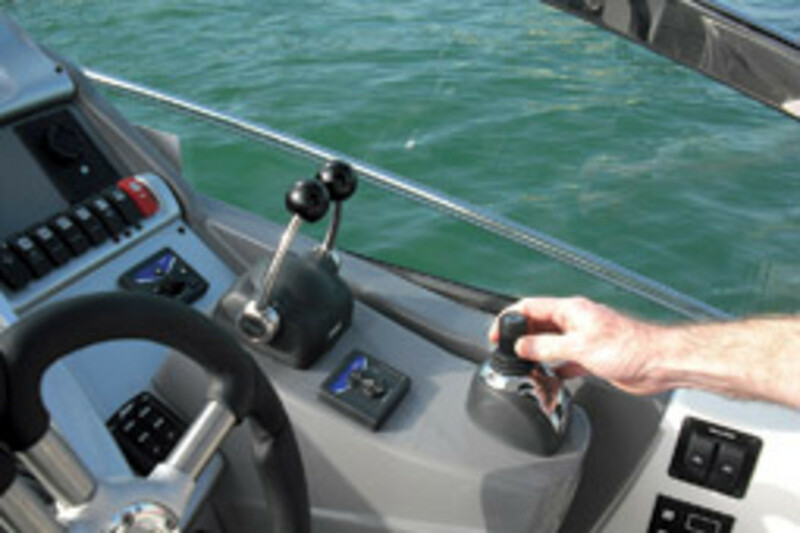 With joystick control, whither the joystick goes — back, forth, sideways, rotating — so goes the boat, for the most part. 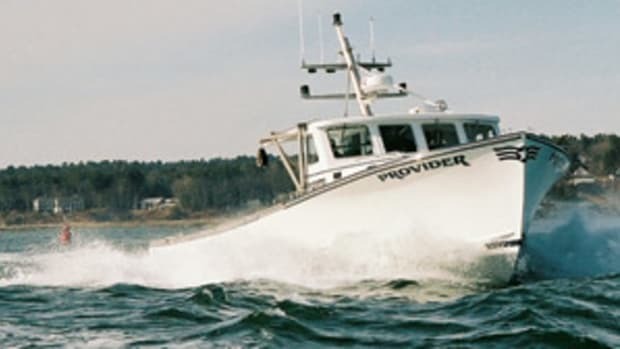 After 30 minutes with a good instructor, practically anyone with basic boat-handling experience can competently handle a 60-footer with pod power. By far the most maneuverable system I’ve run is Volvo’s IPS in Sportfish mode. It allows a very rapid response when working a fish, with the boat backing and twisting with a speed astern and turn rate that’s a wonder to behold — pity the fish. As long as cost wasn’t a factor with the buyer, I don’t know why anyone would purchase a conventional, moderate displacement-to-length, 25-plus-knot planing pleasure boat with inclined shafts when IPS is available. The sterndrive and outboard have the advantage of trainable propellers, so thrust vectors depend on steering angles ahead or astern. The instant the engine goes in gear, thrust is generated in the direction the lower unit is pointing, and this is particularly advantageous when backing, since the boat tends to back in the direction the propeller is facing. But even these lower units have their issues, since a boat backing initially hard to one side will keep swinging in that direction even when the rudder is shifted — especially when backing to port, because a right-hand prop naturally walks in that direction. The only solution is to stop everything and give it a nudge ahead to check the stern swing, a little like backing and filling a single-engine inboard. rotating sterndrive — Merc’s Bravo 2, Konrad’s 560 Twinprop or Volvo’s Duo-Prop, for example — you can even back downwind under good control, something that’s virtually impossible for other single-screw applications that naturally seek the wind when backing, like a weathervane. While an outboard or sterndrive lower unit does not turn as far (28 degrees for a MerCruiser Bravo 3) as a properly set inboard rudder (35 degrees), the turning circle in otherwise similar boats will typically be tighter than the inboard because the lower unit’s thrust is vectored, not just deflected. By comparison, the inboard deflects water off the rudder when running ahead, and the rudder has very little effect when backing down. 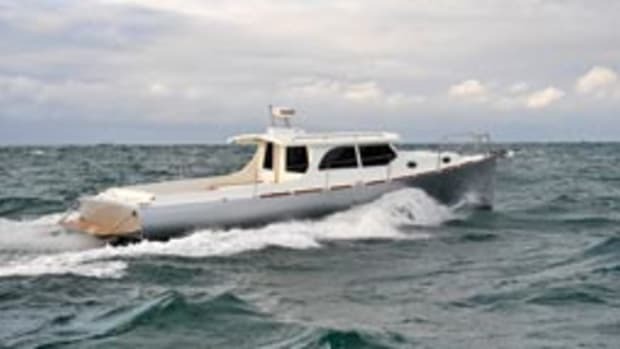 This is especially the case with typical inboard express cruisers and their undersized rudders, which are virtually useless unless the engines are running well above idle speed ahead and no use whatsoever when backing. MerCruiser now offers the Axius system, which, like Zeus, uses a joystick to independently control the port and starboard sterndrives’ heading and thrust, producing thrust vectors to walk the boat sideways or twist it about its heading. However, while Axius increases maneuverability quite a bit dockside and will prove to be a favorite of many boat owners, it does not perform as well as the pods for two simple reasons: 1) the sterndrive propellers are well abaft the transom, so it takes more power to control the direction of the hull’s pivot point; and 2) they’re typically mounted closer to the hull’s centerline, so they can’t develop the moments (force times distance) in relation to each other or to the boat’s pivot point that pods can. In other words, you get a lot more commotion and less response, though it still works well enough in mild wind and current conditions. I’ve run the MerCruiser Axius system in a number of express cruisers, and while the boat will walk sideways and twist — a big advantage around the dock, of course — it takes a lot more throttle and shuddering to get 50 percent of the Zeus or IPS result. If the engines were mounted a foot farther from centerline, the effectiveness would be much improved, but still not on a par with the pods, since the props are so far aft. Incidentally, Volvo also now offers joystick control for twin installations of its diesel and gas DPH and DPS sterndrives. While it doesn’t impact boat handling dockside, lower unit trimability on plane is one reason outboards and sterndrives are so efficient. They can be depressed to lower the stern and raise the bow, reducing frictional resistance and increasing speed for the same fuel burn. Volvo also has a nice feature in its Powertrim Assist option, which adjusts the sterndrive lower unit’s trim angle depending on engine rpm. So when you start coming up on plane, the drive is tucked all the way in for maximum stern lift, then starts to rise automatically as speed picks up. This gives you one less thing to do manually when driving the boat, which allows you to focus more on what’s going on ahead. 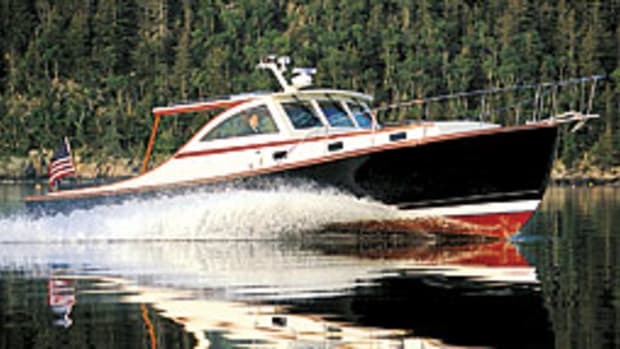 A twin-screw inboard with deep gears and large props handles much more predictably and assuredly dockside than an outboard or sterndrive, and I would much rather back such an inboard into a slip in a crosswind or current. There’s just no substitute traction-wise for the sheer volume of water moved at slow speed by a large-diameter prop. But the straight inboard will be nowhere near as efficient as an outboard or sterndrive because of the tremendous drag of the inboard’s running gear once cruising speeds get up to around 25 knots and higher. 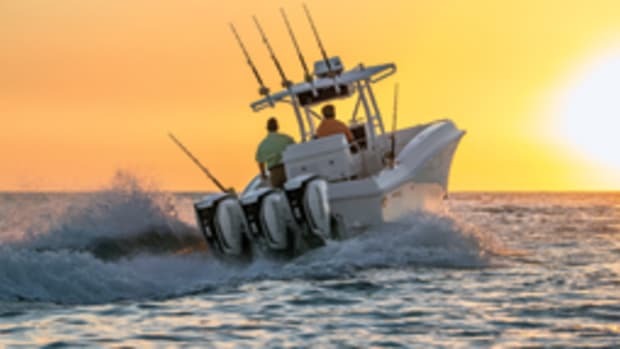 Plus, having twin outboards or sterndrives along with a bow thruster lets you do just about anything you want dockside, assuming sufficient experience. And an outfit like Control Engineering, again, can deliver an integrated outboard-thruster joystick if you want ultimate controllability. Trade-offs, trade-offs. For inboards, an articulating rudder tightens the turning circle dramatically, neatly turning a boat in its own length or very close to it. This two-piece rudder acts like an airplane wing with a flap, with the flaps allowing the wing to generate more lift at lower speeds without stalling. More lift on a rudder (horizontal lift, that is) translates into a tighter turning circle (see www.rudderpower.com or www.bayviewengineeringind.com for examples). A flap on the trailing edge of the rudder adds a second kick, so the rudder angle is effectively much higher without stalling. If the rudder is put over 15 degrees, the flap is angled automatically at another 15 degrees, deflecting the water 30 degrees total. 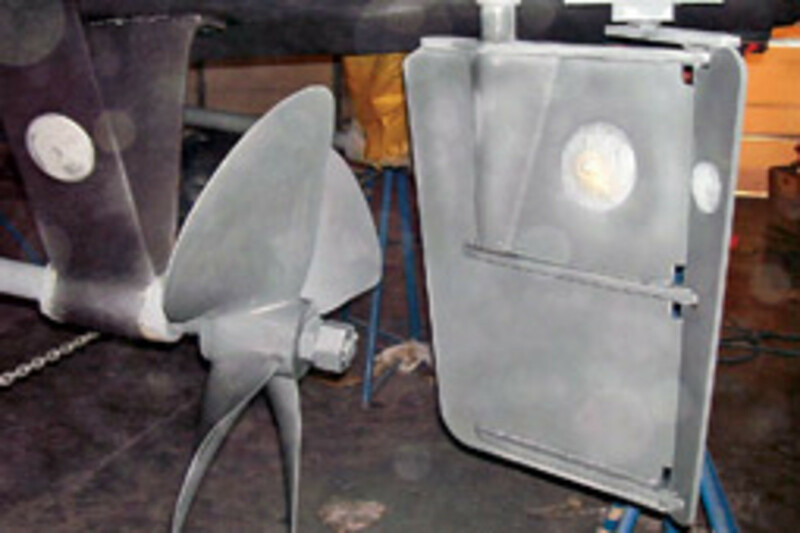 An articulated rudder that turns 35 degrees will deflect the prop’s discharge race at a 70-degree angle, which explains its ability to turn a boat in just over its own length. This is very close to having a stern thruster. These rudders certainly make sense for displacement and semidisplacement hulls, but I would not recommend one for a high-speed planing hull without careful testing. The high degree of responsiveness can create course-keeping problems at higher speeds. For an inboard trawler, certainly, I don’t think there’s a better way to go. An articulating rudder and bow thruster should let you put the boat into any close-quarters slip without incident, assuming you’re a reasonably decent boat handler to start with. And one way to get that seagoing condo to respond with better docking control is to fit it with articulating rudders, weighing the course-keeping issues in advance by prior testing. by shifting into reverse, goosing the throttle to start gaining sternway, then backing off on the throttle so the prop’s walking effect is minimized. The rudder should start to bite and work the stern in the desired direction. I would expect the articulated rudder to stall at lower rudder angles in reverse because of the very high initial angle of attack when backing, as water flow meets the flap at an effective 70 to 90 degrees of rudder angle when hard over. 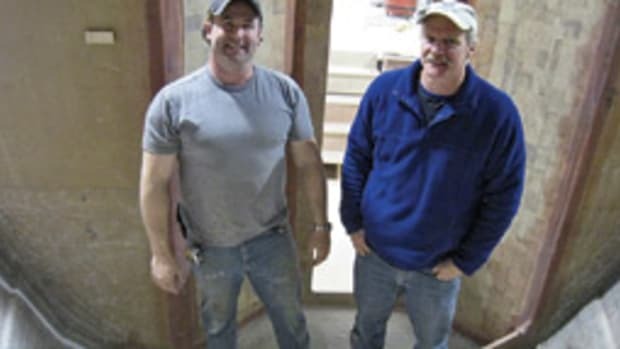 So be sure to try an installation and see for yourself before taking the plunge. I, for one, would plan to do all my turning with the prop turning ahead rather than astern, so make sure you understand the concept of backing and filling thoroughly when turning a single-screw inboard in close quarters. Editor’s note: Next month, Part II of this package will cover steering responsiveness, prop size, hull form, thrusters and more.